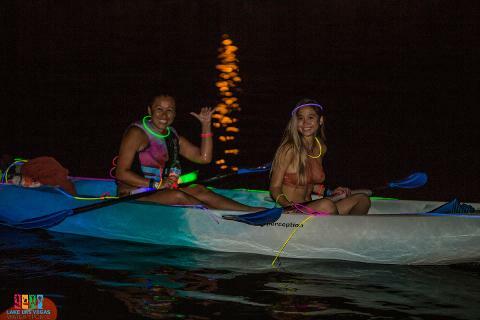 Our night begins with a pre-game party at Reflection Bay beach, or Westin beach, or our floating park in the village in which we supply you with neon glow supplies to light up the lake as we paddle to our destination. 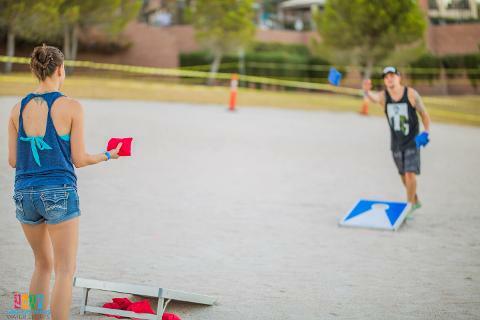 Near the beach or dock, we have food and drink options from third-party vendors along with beach games. 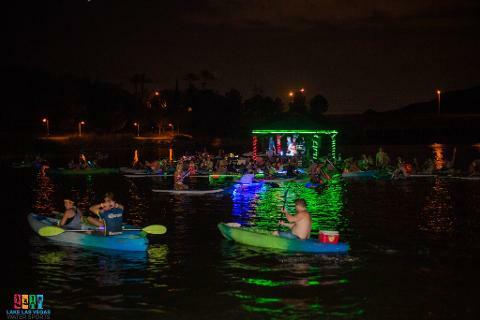 Be sure to come early to enjoy the beach or floating park and meet your fellow paddlers. 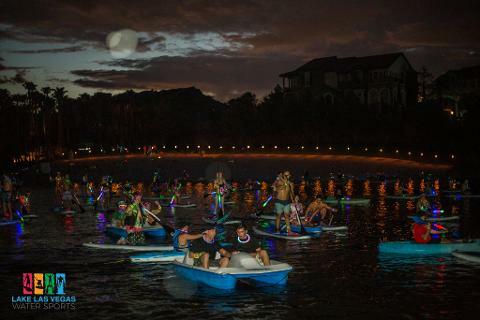 Our paddle will begin when the sky is dark. 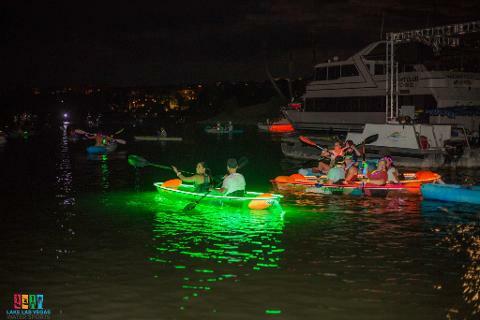 Once we hit the water, it will take approximately 30-45 minutes to reach our destination where we will meet a floating dock with our own live DJ, LED lights, and flame blowers to light up the sky! 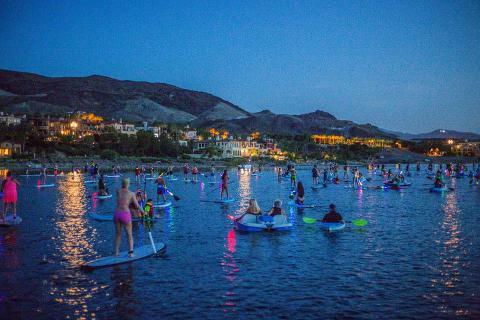 We will paddle around at this destination to enjoy the music and views for 45 minutes before returning to Reflection Bay, Westin, or the village dock. 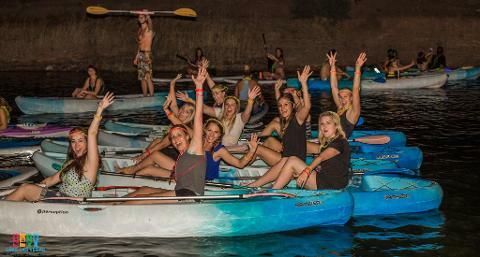 Once the paddle has finished, we don’t stop the party! 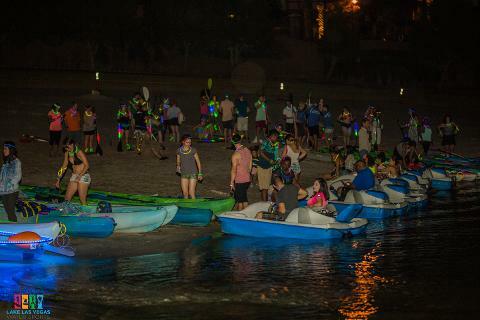 Stick around for an after party either on the beach, Westin Hotel or at the Montelago Village where drinks will be available for purchase. Locations do vary between Westin Hotel LLV, Reflection Bay Golf Course, and the Lake Las Vegas Village. When you register make sure you attach your phone number to receive a text the day of the event of which location we will be departing from. If you would like to reschedule before Sept 8th there is no charge. On Sept 9/10 there is a no change, no refund policy in place. (Traffic, accident, the passing of a family/friend, sickness, etc). If you can not find the location, this IS NOT an exception to be late. If you have a deposit on file with us and you are marked as a no-show or you show up late your card on file will still be charged in full. Weather cancellation: If the weather turns for the worse we will reschedule you to the next available time slot that suits your schedule. NO REFUNDS are given due to poor weather, wind, rain, thunderstorms, or lake closures. At check out, you will be asked to agree that you understand that policy. We will always reschedule if there is a weather cancellation. The only circumstance where we will not reschedule you is if you are marked as a no-show to your appointment. If you arrive 15 minutes or more late to your appointment you are marked as a no-show and rescheduling will not be an option for you.